One never knows what one is going to find when one steps out into the world. Even something as simple as a walk through your neighborhood can result in either mild excitement or full-blown adventure if the cards are right. When the man in this video first set out to explore one of the many construction sites near his home, he never anticipated that he’d find anything of value. He expected to find the same things he always did; detritus and half-demolished structures to explore. He found something else entirely. The man heard something coming from around the side of a nearby building. It sounded like the whining cries of an animal. He turned the corner to see a small dog standing on its hind legs and wagging its tail trepidatiously. He then noticed that the poor thing seemed to be stuck at the waist between a small wall and an even smaller fence. The poor animal’s plight was pretty apparent and the man knew that if he did nothing and left the dog there, it might not survive. He had no idea how long the animal had been there up until that point. It might not have eaten or drunk anything in days. Determined to help, he looked around for anything that might be useful. After a few seconds of looking, the man locates a pile of broken wooden planks in a nearby patch of grass. He picks one up and starts put it to use as a makeshift pry bar, though it seems to little effect. The dog lies down when he approaches, either exhausted from the stress of its ordeal or frightened of the man attempting to rescue it. 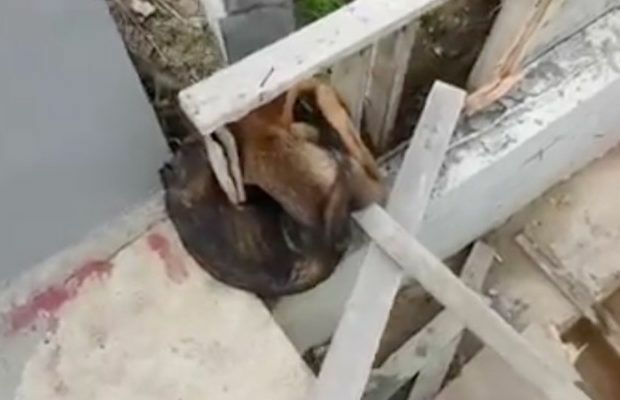 After finding the little dog stuck between the cement wall of a building and smaller, wooden fence, the man decided to put down his phone and attempt to dislodge the animal. Unfortunately, this plan turned out to be much more difficult in practice than it had seemed inside his own head. The man uses a wood plank to break down part of the smaller, wooden wall. Then, after checking on the dog, he tries to use the stick to pry the smaller wall way from the larger one. His thinking seems to be that the dog will be able to squeeze out if he does. Unfortunately for them both, it doesn’t seem to work. The moment the man’s stick touches the back of the dog, the animal begins yelping and barking fearfully at him. It then curls up into a ball and continues to whine as the man stops to think about what in the world his next move is going to be. He knows he shouldn’t get too close, after all. The man then went around to the other side of the wall and grabbed hold of the stick from a different angle. For a brief moment, he makes eye contact with the dog in an attempt to reassure the animal that he is there to rescue it, not to cause it any further harm. It was enough to reassure the dog, but only temporarily. Unfortunately, no sooner did the man attempt to put the stick beneath the dog’s body, then the animal begins to freak out even further. Though it is unclear from the video exactly what he is doing, he seems to be trying to coax the dog upwards. At this point though, the animal is too stressed to understand this. It yelps and struggles as it attempts to avoid the stick. After at least a minute or so of trying to release the dog, the man is still unsuccessful. What’s worse is that his attempts, however altruistic, seem to be doing little more than stressing out the already overstressed canine. He doesn’t give up though. The man is determined to unpin the animal. Realizing his current course of action wasn’t working, the man changes tack. He proceeds to climb up onto the cement slab and points his stick back at the dog. He’s trying to pry above the animal by wedding the stick between the cement wall and the smaller, broken wall, but the terrified animal doesn’t know this and attempts to bite at the tool. A moment later and the camera has switched angles again. This time, we can see the man looking over the frightened pup. Driven by fear and uncertainty, it looks as though the animal has wedged itself further in and around the smaller wooden wall. The fear in its eyes says everything. It wants to trust the human, but it just can’t. The camera then shifts back and we can see the man walk around to the other side of the concrete platform with two more sticks. The dog, meanwhile, seems more alert now and less scared. Perhaps the poor trapped animal finally understands why the man has come. Taking the two sticks in hand, the man moves to try again. After several unsuccessful attempts at trying to pry the wooden wall away from the abutting concrete one, the man realizes he has to reassess the situation. He then shifts the camera’s focus to get a closer look at the terrified dog. He has one more trick up his sleeve, however. Undaunted by the animal’s yelping protests, the determined rescuer presses forward. He hops back up onto the platform and continues pushing at the pieces of wood surrounding the trapped animal. He is going to get the dog out, whether the poor frightened thing likes it or not. The man prods and pushes, then jumps back, he jostles and pries, then jumps back again. He is careful never to get too close to the struggling dog. The animal could be perfectly friendly, but even the tamest of dogs will snap at someone if they’re frightened. Eventually, after a few well-positioned pieces of wood, the man manages to wedge his stick in just the right way as to allow the dog can extricate itself from the trapped corner of the wrecked building. A little unsteadily, the animal gets to its feet and pulls itself out fully. “Yes!” the rescuer exclaims to the camera. Behind him, the dog wags its tail triumphantly, happy to be free of its predicament. The final shot is one of the unsteady dog walking sideways into the weeds. The man calls for the “puppy” but the dog just keeps walking. The man continues to make a few sounds as the dog walks away from him. Realizing that the dog is probably not going to give him any sort of acceptable thank you, he waves and lets it go on its merry way. After all of that struggling, both of them deserved at least a few minutes to themselves. The man takes one more attempt at rescuing the dog and manages to wedge the stick in just the right place. A moment later and the dog is free and walking on its way. The two-part ways rather unceremoniously and the man returns home to spread the word of a good deed well done.